The Heinkel He 111 was a German aircraft designed by Siegfried and Walter Günter at Heinkel Flugzeugwerke in 1934. Through development it was described as a “wolf in sheep’s clothing”. Due to restrictions placed on Germany after the First World War prohibiting bombers, it masqueraded as a civil airliner, although from conception the design was intended to provide the nascent Luftwaffe with a fast medium bomber. Perhaps the best-recognised German bomber due to the distinctive, extensively glazed “greenhouse” nose of later versions, the Heinkel He 111 was the most numerous Luftwaffe bomber during the early stages of World War II. The bomber fared well until the Battle of Britain, when its weak defensive armament was exposed. Nevertheless, it proved capable of sustaining heavy damage and remaining airborne. 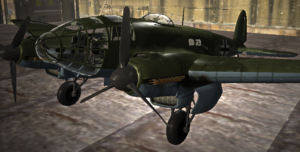 As the war progressed, the He 111 was used in a variety of roles on every front in the European theatre. It was used as a strategic bomber during the Battle of Britain, a torpedo bomber in the Atlantic and Arctic, and a medium bomber and a transport aircraft on the Western, Eastern, Mediterranean, Middle Eastern, and North African Front theatres.